The goal of a consumer is to get maximum satisfaction from the commodities he purchases. At the same time, the consumer possesses limited resources. 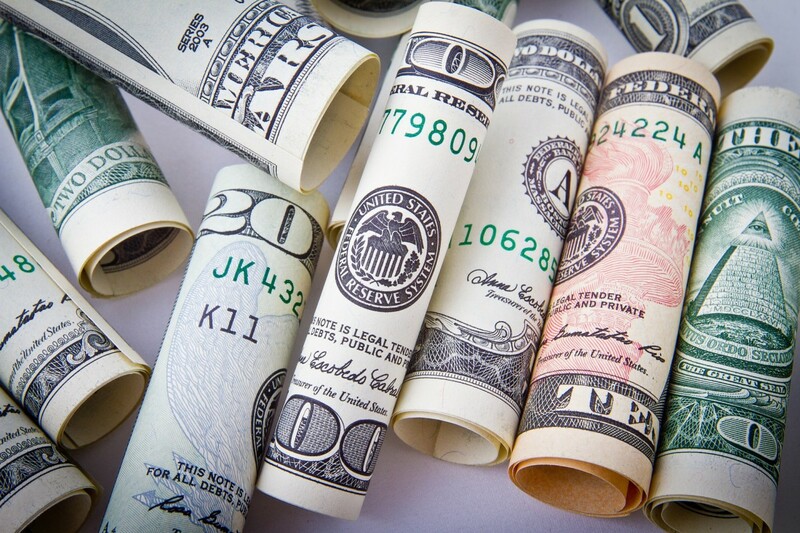 Hence, he is trying to maximize his satisfaction by allocating the available resources (money income) among various goods and services rationally. This is the main theme of the theory of consumer behavior. Further, you could ascertain that a consumer is in equilibrium when he obtains maximum satisfaction from his expenditure on the commodities given the limited resources. You can analyze consumer’s equilibrium through the technique of indifference curve and budget line. The consumer under consideration is a rational human being. This means that the consumer always tries to maximize his satisfaction with limited resources. There prevails perfect competition in the market. 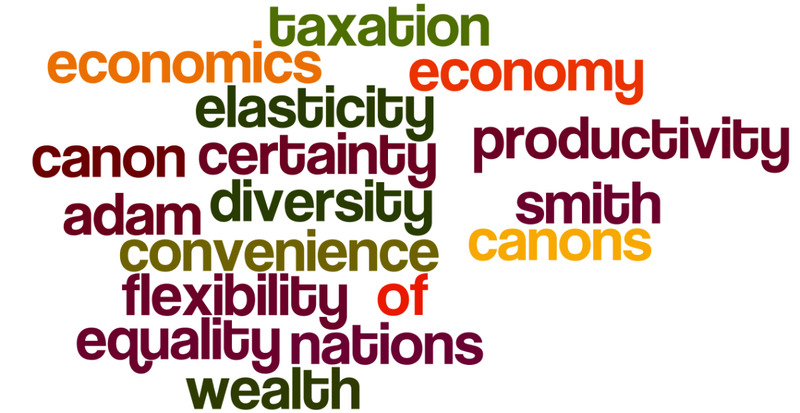 Goods are homogeneous and divisible. The consumer has perfect knowledge about the products available in the market. For instance, prices of commodities. Prices of commodities and consumer’s money income are given. Consumer’s indifference map remains unchanged throughout the analysis. Consumer’s tastes, preferences and spending habits remain unchanged throughout the analysis. Suppose there are two commodities, namely X and Y. Given the market prices and the consumer’s income, the price line shows all the possible combinations of X and Y that a consumer could purchase at a particular time. Let us consider a hypothetical consumer who has a fixed income of $8. Now, he wants to spend the entire money on two commodities (X and Y). 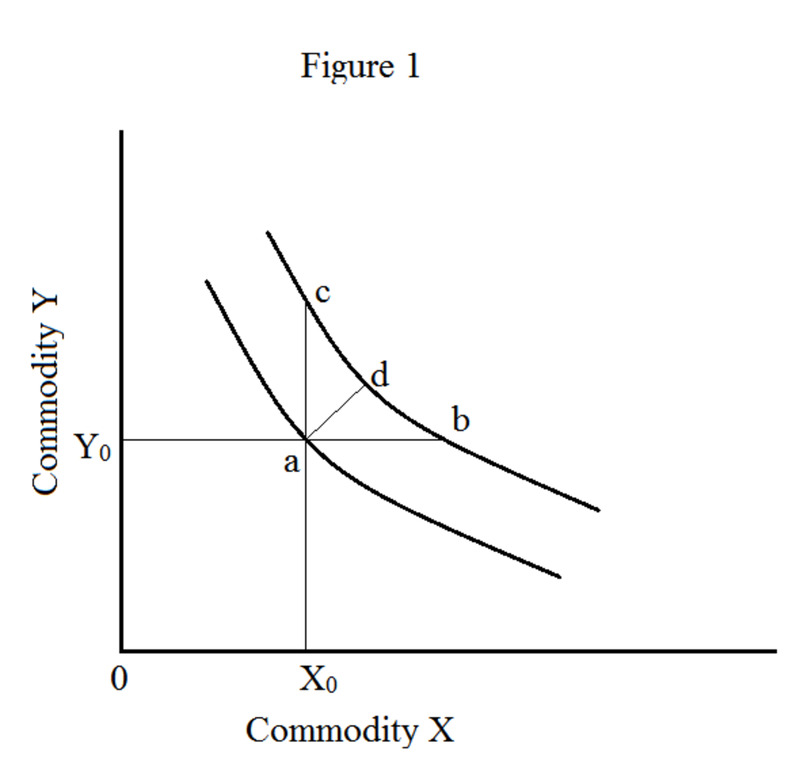 Suppose the price of commodity X is $2, and the price of commodity Y $1. 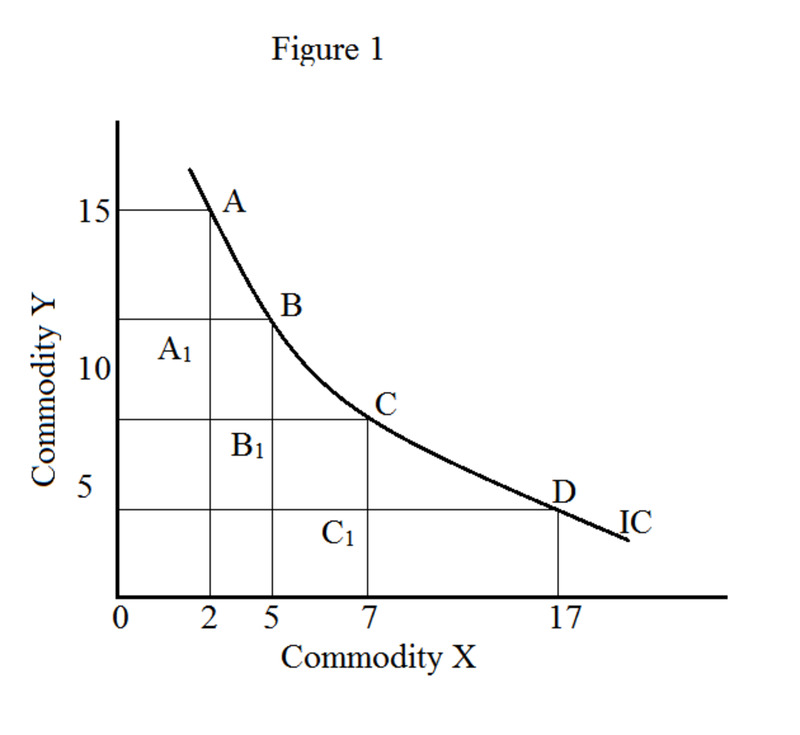 The consumer could spend all money on X and get 4 units of commodity X and no commodity Y. Alternatively, he could spend entire money on commodity Y and get 8 units of commodity Y and no commodity X. The table given below exhibits the numerous combinations of X and Y that the consumer can purchase with $8. 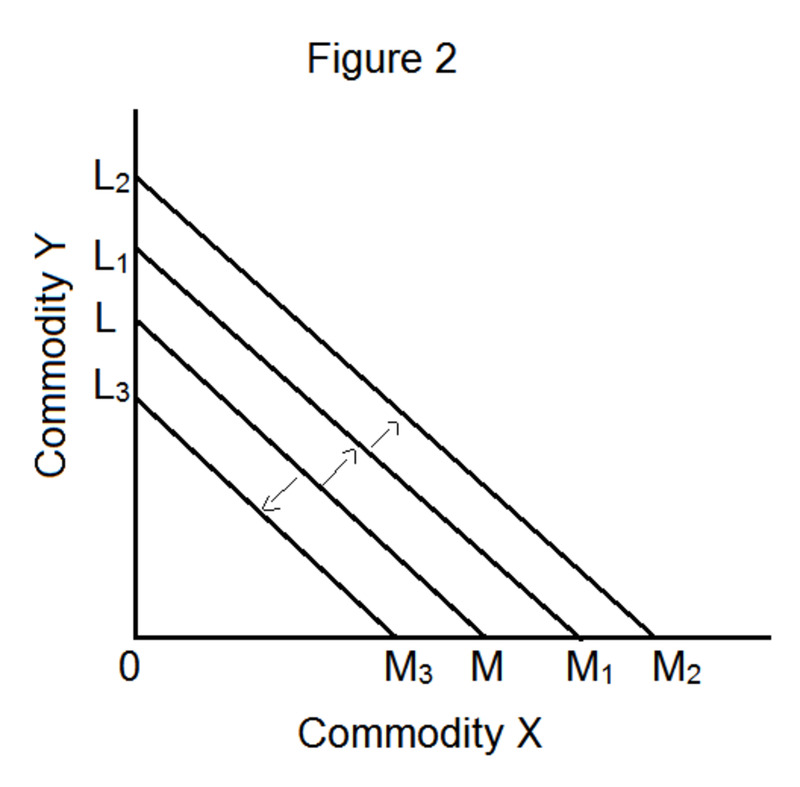 In figure 1, horizontal axis measures commodity X and vertical axis measure commodity Y. The budget line or price line (LM) indicates various combinations of commodity X and commodity Y that the consumer can buy with $8. The slope of the budget line is OL/OM. At point Q, the consumer is is able to buy 6 units of commodity Y and 1 unit of commodity X. 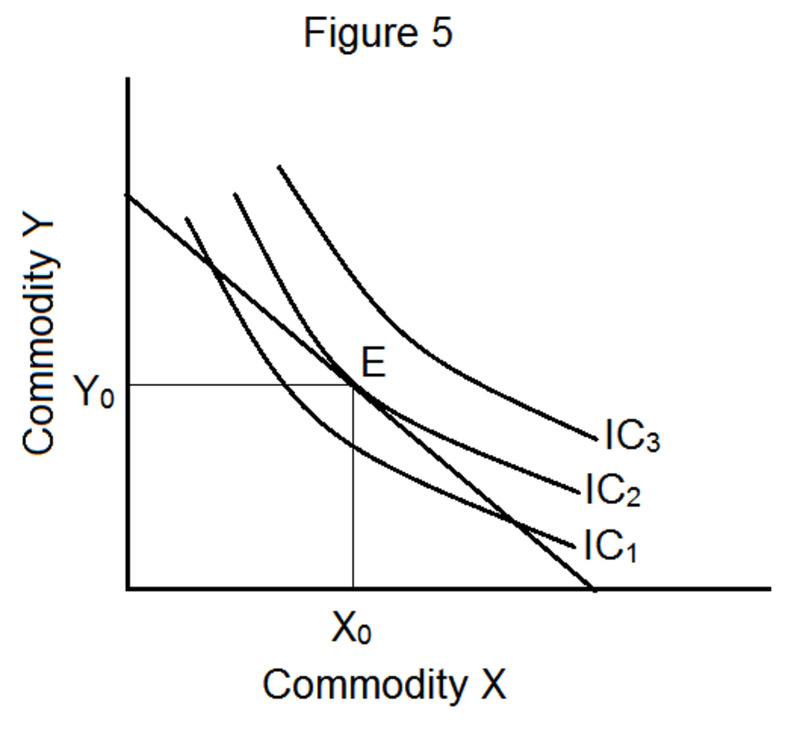 Similarly, at point P, he is able to buy 4 units of commodity Y and 2 units of commodity X. 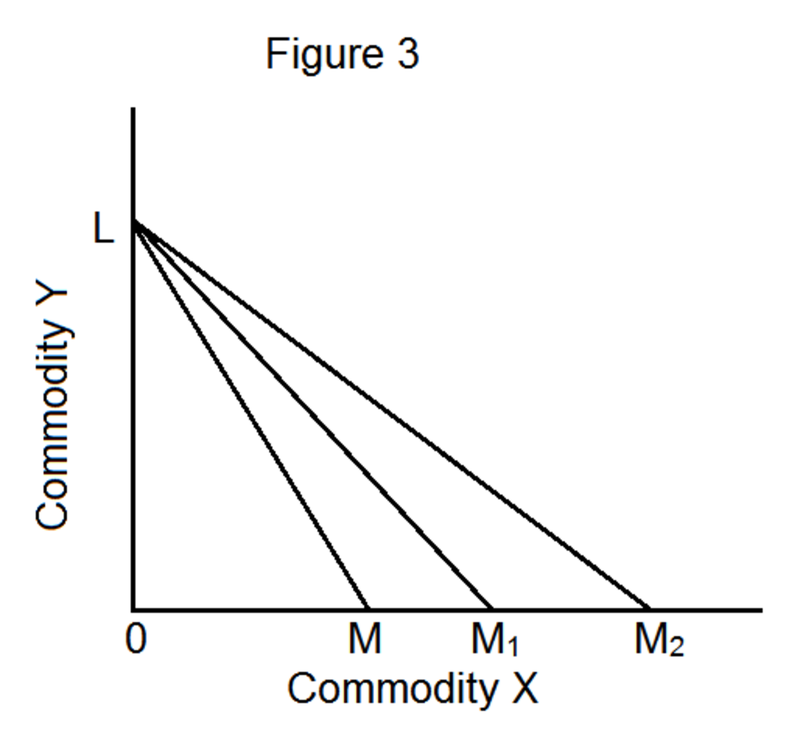 The slope of the price line (LM) is the ratio of price of commodity X to price of commodity Y, i.e., Px/Py. 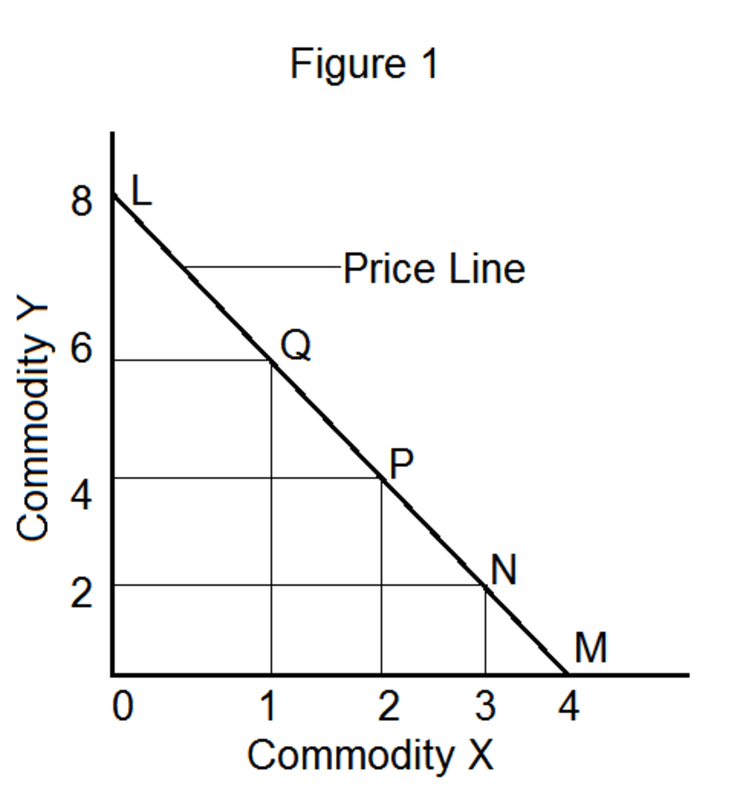 In our example, price of commodity X is $2 and price of commodity Y is $1; hence, the slope of the price line is Px. Note that the slope of the budget line depends upon two factors: (a) money income of the consumer and (b) prices of the commodities under consideration. An outward parallel shift in the budget line occurs because of an increase in consumer’s money income provided that the prices of commodities X and Y remain unchanged (it means constant slope - Px/Py). Likewise, a reduction in consumer’s money income creates a parallel inward shift in the budget line. In figure 2, LM denotes the initial price line. Assume that the prices of the two goods and consumer’s money income are constant. Now, the consumer is able to purchase OM quantity of commodity X or OL quantity of commodity Y. If his income increases, the price line shifts outward and becomes L1M1. He can now buy OM1 quantity of commodity X and OL1 quantity of commodity Y. A further increase in income causes a further outward shift in the price line to L2M2. Price line L2M2 indicates that the consumer can buy OM2 quantity of commodity X and OL2 quantity of commodity Y. Similarly, if there is a decrease in consumer’s income, the price line will shift inward (for example, L3M3). 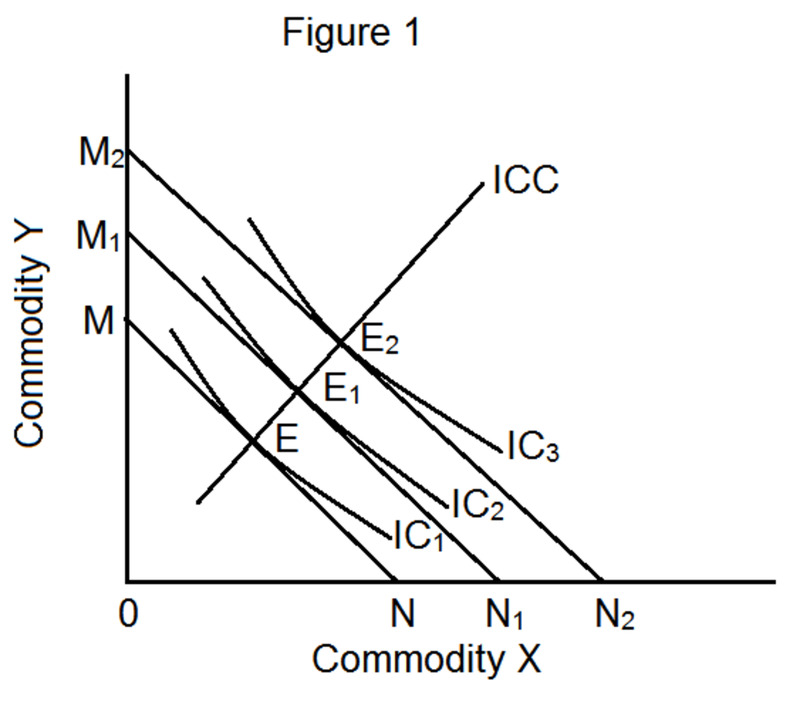 The slope of a price line is associated with the prices of commodities under consideration. Hence, if there is a change in the price of any one of the commodities, there will be a change in the slope of the price line. 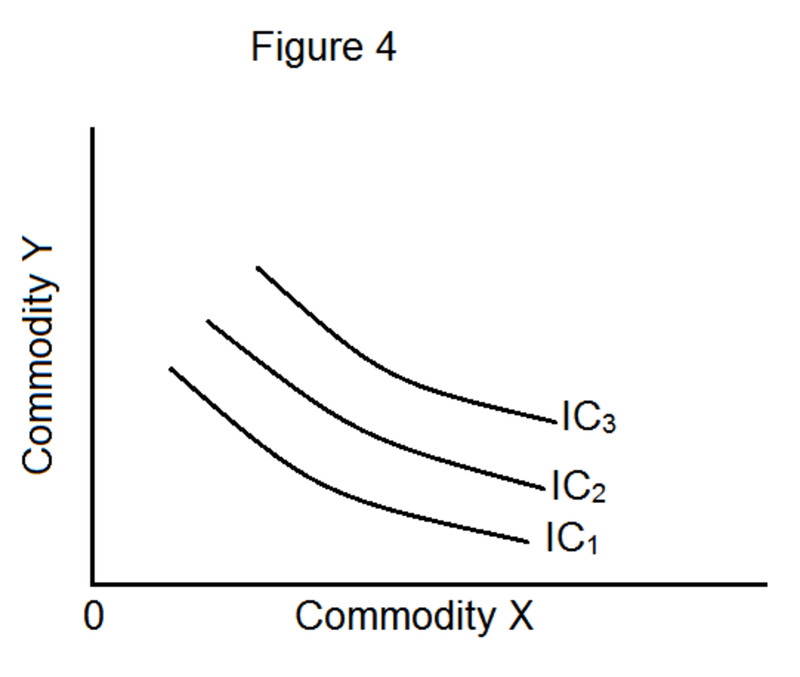 Assume that the price of commodity X decreases and the price of commodity Y remain unchanged. In this case, the price ratio Px/Py (slope of price line) tends to decrease. In figure 3, this scenario is denoted by the shifts in the price line from LM to LM1 then to LM2 and so on. Conversely, if the price of commodity X rises, the price ratio Px/Py will rise. This leads to the price line shifts from LM2 to LM1 and to LM. A set of indifference curves that shows a consumer’s preferences is known as an indifference map. The indifference map of a consumer, since is composed of indifference curves, exhibits all properties of a normal indifference curve. Some of the most important properties of an indifference curve are: indifference curves are convex to the origin; they always slope downwards from left to right; higher indifference curves indicate higher levels of satisfaction; they do not touch any of the axes (example: figure 4). MRSxy = MUx/MUY = Px/Py. Secondly, indifference curve must be convex to the origin. Now we have both budget lines and indifference map of the consumer. A budget line represents consumer’s limited resources (what is feasible) and indifference map represent consumer’s preferences (what is desirable). The question now is that how the consumer is going to optimize his limited resources. An answer for this question would be consumer’s equilibrium. In other words, the consumer’s equilibrium means the combination of commodities that maximizes utility, given the budget constraint. To obtain consumer’s equilibrium graphically, you just need to superimpose the budget line on the consumer’s indifference map. This is shown in figure 5. At point E, consumer’s equilibrium is attained. Because the indifference curve IC2 is the best possible indifference curve that the consumer can reach with the given resources (budget line). The tangency of indifference curve IC2 and the price line represent the above statement. 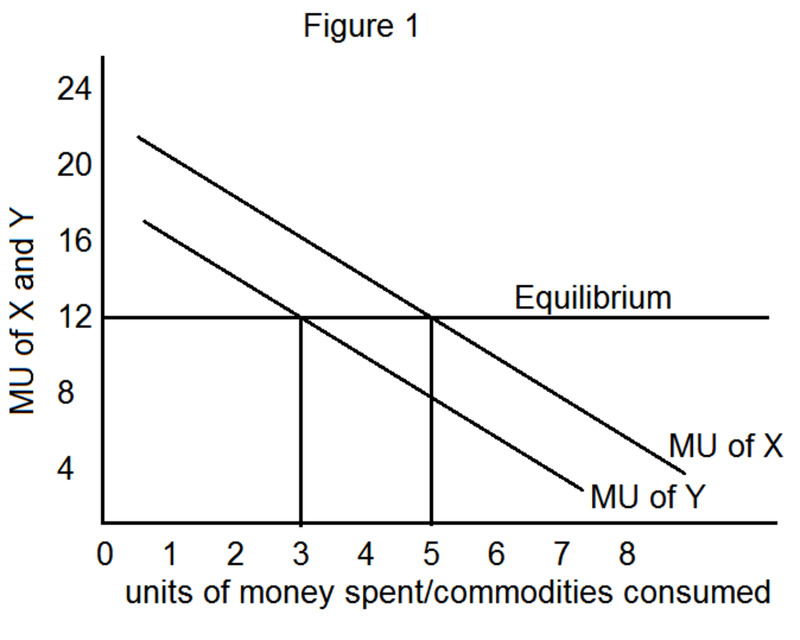 At the point of tangency, the slope of the budget line (Px/Py) and the marginal rate of substitution (MRSxy = MUx/MUy) are equal: MUx/MUy = Px/Py (first condition for consumer’s equilibrium). 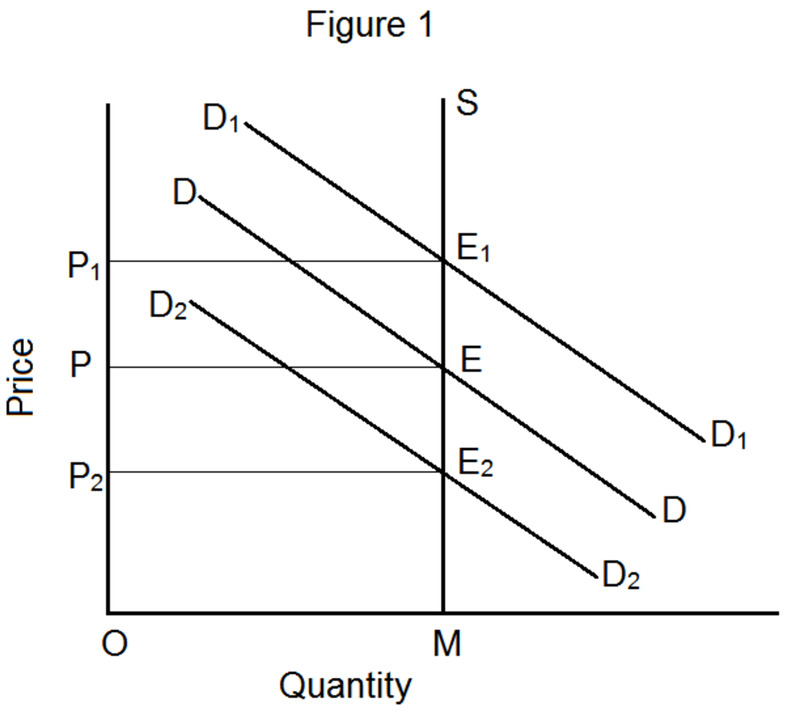 From figure 5, we can understand that the second condition for consumer’s equilibrium (indifference curve must be convex to the origin) is also fulfilled. A small algebraic manipulation in the above equation gives us MUx/Px = MUy/Py, which is the marginal utility per dollar rule for consumer’s equilibrium. Thus, all the conditions for consumer’s equilibrium are fulfilled. The combination (X0Y0) is an optimal choice (point E) for the consumer. Interesting and very important to all the economics students. By the way am a third year student in the University of Botswana(Africa) and thanks a lot! Impressive hub. Voted up and useful.